Do you love a bouncy blow-dry or a sleek straight style but worry about the heat damage it can cause to your hair? 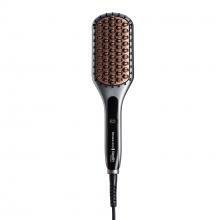 Introducing the Keratin Protect Hair Dryer that lets you create those statement looks whilst protecting your hair. 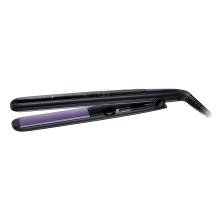 The professional dryer’s advanced ceramic coated grille infused with Keratin and Almond Oil gives smooth, healthy looking blow dry results. Say farewell to fly-away frizz thanks to the ingenious ionic conditioning - 90% more ions* help reduce static to give your hair a radiant, frizz-free shine. Finished in a shadow grey with rose gold highlighting, the powerful 2200w hair dryer has a ceramic-coated grille for even heat distribution. The dryer is powered by a long life AC motor complete with three heat settings, a True Cool shot to add shine and set your style, and two speeds for complete control. 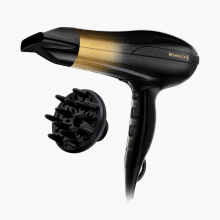 The innovative Keratin Protect Hair Dryer is designed to help protect your hair from the damaging effects of dryer heat, so now you can achieve a sensational style and healthy looking finish effortlessly. Straight or naturally curly locks, thick, fine or frizzy – every hair type is covered with the Keratin Protect dryer. And with two concentrators and a diffuser, you’ve got the flexibility to try new style ideas – simply choose which is best for you. *Vs a standard Remington Dryer.